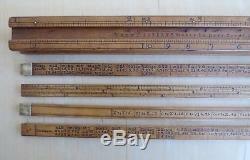 18th Century, 12 Long, Gauger's Slide Rule (4-Sided) by Edward Roberts, London. Imprinted Maker's Name: EDW. D ROBERTS, Maker in Dove Court Old Jewry LONDON. Super Rare 12, Four-Sided (Everard Type) Gauger's Slide Rule. Very early circa 1749 to 1784. Scales: Wine and Ale Gallon Marks. Lots of very interesting additional Scales and Tables on the back of each slide. Dimensions = 12 long x 13/16 x 1. Construction: Boxwood with Brass end tips. Brass end tips are in excellent condition (note, as the rule was made, there is one brass tip on each slide). Slides function properly (one slide is a bit tight). A couple of very minor nicks. Some areas of light staining. Overall an absolutely beautiful rule. The item "Edward Roberts, UK. 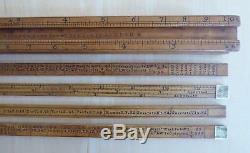 12 (4-side, 4-Slide) Gauger's Slide Rule, 18thC. RARE-FINE" is in sale since Wednesday, October 10, 2018. This item is in the category "Antiques\Science & Medicine (Pre-1930)\Scientific Instruments\Other Antique Science Equip". The seller is "rulenut" and is located in South Lake Tahoe, California.